Finally... 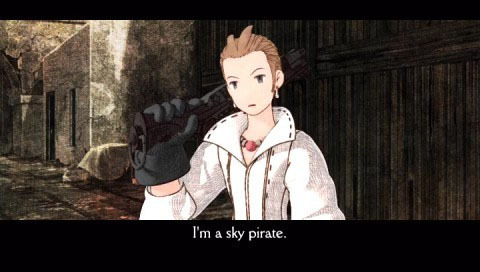 Final Fantasy has arrived on the PlayStation Portable which revolves around the kingdom of Ivalice and begins after the loss of the Fifty Years War. Unfortunately for this ravaged land, the King no longer reigns and his son is far too young. With turbulent politics involved within the Royal family, the king's younger cousin, Duke Goltanna is named regent. Duke Goltanna carries the banner of the Black Lion and the White Lion banner has been raised again by Duke Larg which sets the scene for this current incarnation of the Final Fantasy series in this exciting turned based Japanese RPG epic. 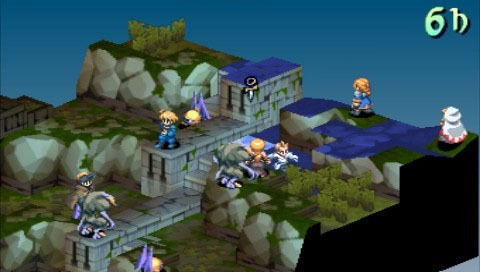 In Final Fantasy Tactics - The War of the Lions, gamers control four to six characters on a grid based board. On the board, the player has the ability to perform a variety of tactics such as move, retreat, use an item, attack or cast a spell with the enemies also having this ability. 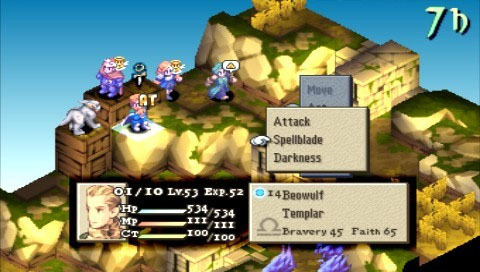 Although the title is reminiscent of the previous Final Fantasy Tactics title, the game has received a boost in the graphics department with the that famous gameplay that is almost perfect. The title also features an in-depth levelling system which allows for a myriad of options thanks to the "job" system, which allows your characters to change their "classes" or jobs. This makes for some unique and interesting gameplay, giving he player a variety of ways of completing the title. Although some jobs require certain characters to complete, you have the option of being multi-classed. For instance, a character may be a Level 6 Knight but can also be a Level 5 White Mage. The PSP version also contains 22 classes plus a hidden new character from the world of FF XII which is the universe this title is based in. The battles of the title can range from easy to quite difficult, depending on your current point in the storyline, your characters abilities and your opponents. Although you control some key characters in the title, there are also some basic soldiers who will tag along with your main characters which come and go. The title may sound a little complex, however the developers have ensured that the game does a great job at teaching the gamer the basic ins and outs of the title with its inbuilt tutorials. However in a few hours, even the novice gamer will be master tactician provided they are patient at the beginning and willing to learn. Graphically, Final Fantasy Tactics War of the Lions is an unusual game on the PSP that uses good old fashioned sprite based graphics that will allow some gamers to reminisce. Although more than detailed then the previous titles, the game looks quite impressive and has a Japanese cartoon feel to it. The game also features some gorgeous cutscenes that will really immerse you into this amazing world of swords and sorcery. Musically, FFT War of the Lions features that orchestral Final Fantasy soundtrack thanks to the works of Hitoshi Sakimoto and Masaharu who lend their mastery to the game. Definitely play this title with headphones in order for you to enjoy the musical score. To compliment the graphics and soundtrack, the title contains all the ambient sounds of the kingdom of Ivalice and the majestic battles. In conclusion, Final Fantasy Tactics - The War of the Lions is your classic Final Fantasy epic, made famous on the NES and PSOne with its classic story, brilliant yet time-consuming gameplay and 21st century portable console graphics. Definitely recommended to lovers of the classic title or for those that cannot get enough of Final Fantasy and who can blame them. Brilliant!